UFC matchmakers reportedly are mulling over a potential heavyweight bout between Stipe Miocic and Jon Jones. 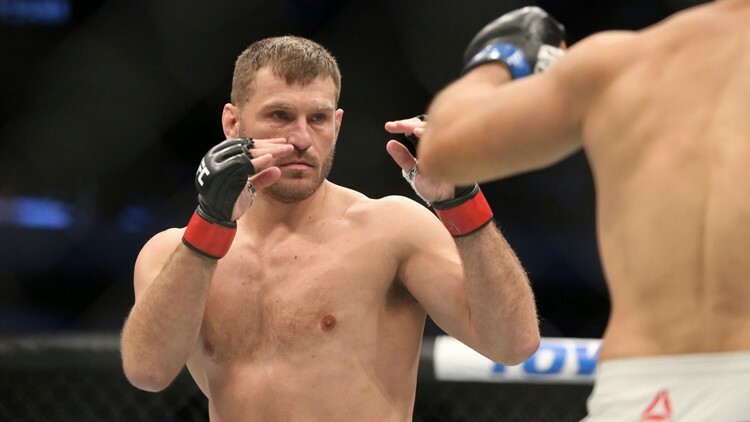 CLEVELAND — Former UFC heavyweight champion Stipe Miocic has been adamant about waiting for a rematch with Daniel Cormier, but the matchmakers at the Ultimate Fighting Championship may have other ideas for his next opponent. According to former UFC title contender Chael Sonnen, ESPN’s Ariel Helwani said that UFC officials are considering a bout between Miocic and current light-heavyweight champion Jon “Bones” Jones that will take place at heavyweight. Miocic has been pining for a rematch with Cormier since dropping the championship to him via a first-round knockout in the main event of UFC 226 at T-Mobile Arena in Las Vegas last July, but to this point, his calls for a title bout have gone unanswered. Cormier’s comments came just over a month after he left open the possibility of giving Miocic a rematch should a potential super-fight with former heavyweight king Brock Lesnar, the current WWE Universal Champion, not materialize. “If it ain’t Brock, I want to fight Stipe Miocic and give him what’s rightfully his, a rematch for this title,” Cormier said in an appearance on “The MMA Hour” on December 31. Miocic was swift and succinct with his response to Cormier’s rant. Miocic felt he was winning for much of the first round against Cormier in his fourth defense of the heavyweight championship, despite taking a thumb to the left eye on an attempted shove from the challenger early in the bout. However, out of a clinch, Cormier faked an uppercut, came over the top with a right-handed strike and floored the defending champion. With Miocic on his back, Cormier pounced and landed multiple strikes before the referee called a stop to the contest. The record-holder for the most consecutive successful defenses of the UFC heavyweight championship, Miocic is 18-3-0 in his professional career, including a 12-3 mark since joining the preeminent organization in mixed martial arts. And Miocic promises to have a different result if granted the rematch with Cormier.